When you think of skydiving, first thing that comes to your mind is freefall: flying your own body in the open sky, the thrill, the rush, the wind and absolute freedom from any worries. It’s a totally fantastic experience that is out of this world, but there is also the second part of the jump that’s equally exciting. When skydiving in NJ, your flight under the parachute offers some breathtaking scenic views of the Garden State. Here are our tips on what not to miss on your first jump. 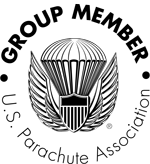 Once your instructor opens the parachute, the rush and speed of freefall will change into a slow, relaxed, quiet flight. You will have a chance to take a deep breath, with your heart still pounding from the rush of freefall. Then you will start looking around and you will see the local area from a new angle. Ask your instructor to point out the landmarks to you. New Jersey has truly beautiful views to offer. Over Cross Keys, we like to show the airport, the rows of little airplanes parked along the taxiways, our skydiving hangar with the big Skydive Cross Keys logo on top. Right next door, we have a beautiful golf course, the parks, the lakes, the highways. Looking from above at the busy life on the ground and realizing how little everything matters at this moment, while you’re flying up in the clouds, is such a fantastic feeling. Take a few deep breaths and take it all in. And here’s our favorite view over at Cross Keys: the beautiful Philadelphia skyline. It’s easy to see on a clear day. Ask your instructor to point it out to you. You can see as far as Atlantic City if the clouds aren’t in your way. And what if they are? They’re fun too, and you get to see them at a totally new angle. Take the toggles in your hands, try a couple turns on your canopy, and enjoy the flight. Skydiving in NJ is a truly amazing experience, and we love every chance to show it! Ready to schedule your next big adventure?